Chicago – Treatment for dilated cardiomyopathy must be continued indefinitely even among patients who appear to have achieved a complete recovery, according to results of a randomized trial. In the latebreaker results presented at the 2018 AHA Scientific Sessions, only 44% of patients were able to complete withdrawal of heart failure (HF) therapies over a six-month period without deterioration in left ventricular ejection fraction (LVEF) or other signs of relapse. Although characterized as a pilot study and undertaken at a single center, patients with a history of dilated cardiomyopathy (LVEF <40% at diagnosis) who were enrolled in TRED-HF were eligible for entry only if they appeared to have full recovery. Entry criteria included a LVEF >50%, a normal left ventricular end-diastolic volume index (LVEDVI), and NT-proBNP level <250 ng/L. They were also required to be asymptomatic (NYHA class I). Of the 51 enrolled patients, 25 were randomized to a phased withdrawal program and 26 were randomized to continue therapy. With three weeks of monitoring between each step, patients on standard therapy were first withdrawn from diuretics, then from their mineralocorticoid receptor antagonist, then from beta blockers, and finally from ACE inhibitors or angiotensin receptor blockers. Clinical evaluation was performed after each withdrawal. The primary endpoint was reaching one of any of the signs of relapse, which were a reduction in LVEF by >10%, an increase in LVEDVI by >10%, a two-fold rise in NT-pro-BNP or any value >400 ng/L, and clinical evidence of HF. Patients in the two arms were compared at six months, and revealed that those randomized to continued therapy were permitted to crossover to the phase withdrawal protocol at the end of this period. After six months, 11 (44%) of the 25 patients randomized to withdrawal met a primary endpoint of relapse versus none of those who were in the arm who continued therapy. Of the 26 patients initially randomized to continue therapy, 25 elected to attempt withdrawal. Nine (36%) had relapse in over the next six months (Fig. 1). 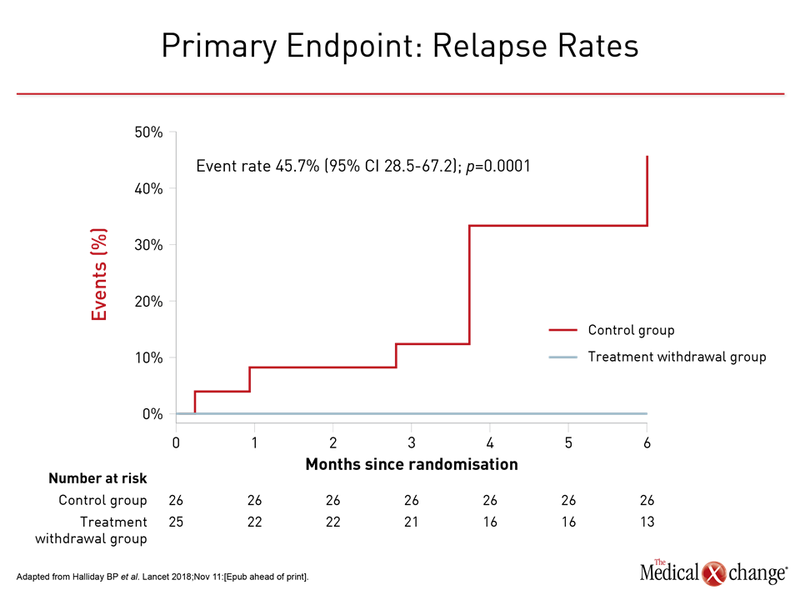 In both groups, “longer term follow up would likely have demonstrated even greater rates of relapse,” Dr. Halliday reported. He noted that the estimated mean effect of withdrawal relative to baseline on some measures of HF, including LVEF (-9.5%; P=0.0001) were highly statistically significant. Although there were no unplanned HF hospitalizations, major adverse cardiac events (MACE), or ventricular arrhythmias over the course of follow up, three patients developed atrial fibrillation after treatment withdrawal. Patients who feel well and have normal pump function after dilated cardiomyopathy frequently request withdrawal of therapy, according to Dr. Halliday. However, there has been no prospective evidence until this study to determine whether this is safe. He concluded that all such patients should be advised against therapy withdrawal at this time. In those who insist, “a robust monitoring plan should be in place” due to this evidence that relapse is common. An expert invited by the AHA to discuss the results agreed. According to Dr. Jane E. Wilcox, a cardiologist at the Northwestern Feinberg School of Medicine, Chicago, Illinois, the results of this relatively small study cannot be considered definitive, but they do “support continuing HF therapy without interruption” even among patients who are doing well. “In 2018, we are unable to identify true recovery, if it exists. Remission is an appropriate term for those patients fortunate enough to have improved ventricular function in response to therapy,” Dr. Wilcox said. She, like Dr. Halliday, suggested that there may be a subgroup that can safely discontinue therapy but these have not been identified.